The newest little prince in Sweden officially has a name and title! Read on to learn more, and to see the jewels worn by his grandmother and aunts at today's Te Deum service held in his honor. 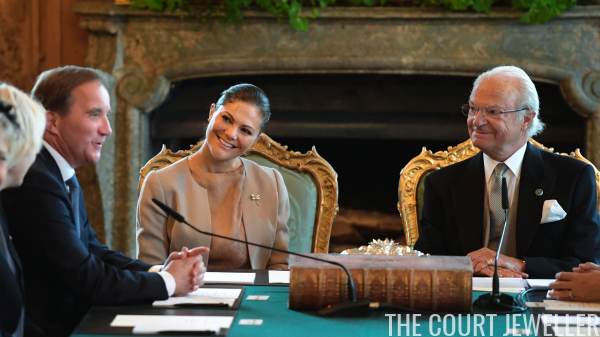 Prime Minister Stefan Lofven joined King Carl XVI Gustaf and Crown Princess Victoria to officially announce the new prince's name and title. The baby is Prince Gabriel Carl Walther of Sweden, Duke of Dalarna. Although he is the first Swedish prince to bear the name Gabriel, the prince joins other European royals with the name, including Prince Gabriel of Belgium (the younger son of King Philippe) and Prince Gabriel of Nassau (grandson of the Grand Duke of Luxembourg). Carl is a common Swedish royal name, shared by the baby's father and grandfather. Walther was the first name of Queen Silvia's father. Two other Swedish princes have held the Dalarna dukedom: Prince August, the youngest son of King Oscar I, and Count Carl Johan Bernadotte, uncle of the present king. (Carl Johan renounced his royal title and dukedom when he married a commoner in 1946.) Prince Gabriel's mother, Princess Sofia, spent part of her childhood in Dalarna. 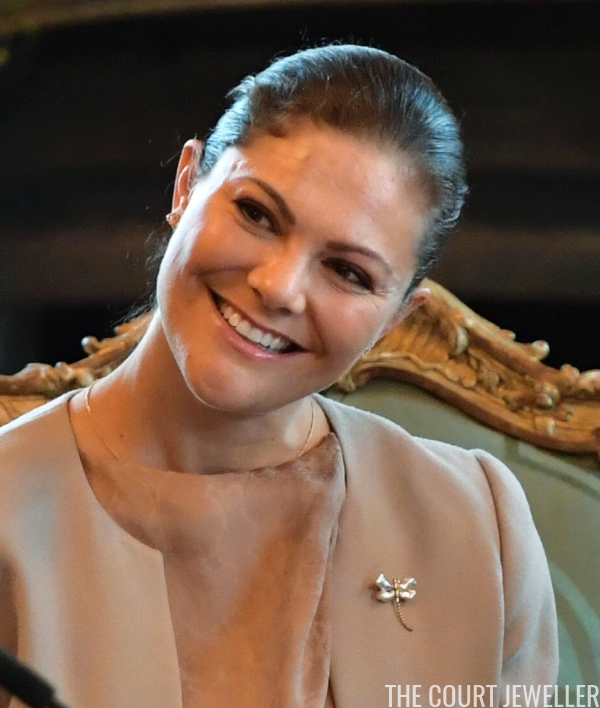 Gabriel's aunt, Crown Princess Victoria, wore a delicate dragonfly brooch for her nephew's name announcement. 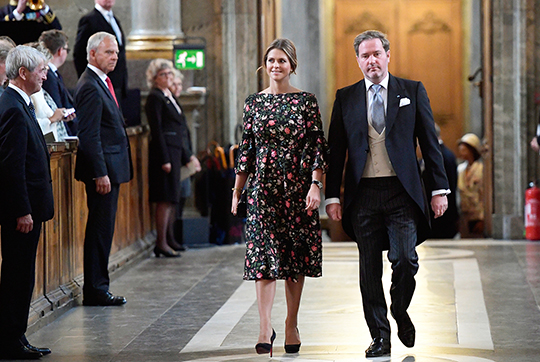 Numerous members of the royal family attended the Te Deum service held on Monday in Gabriel's honor. 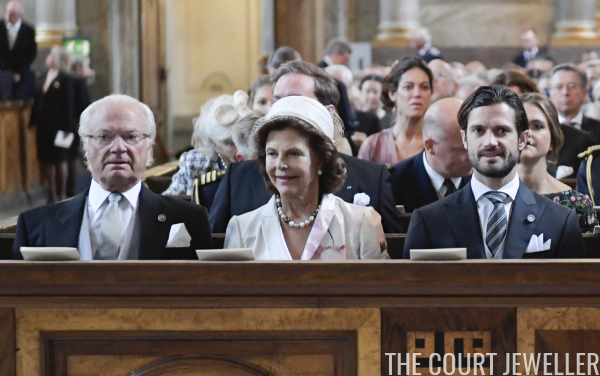 His grandmother, Queen Silvia, wore multicolored pearls for the occasion. 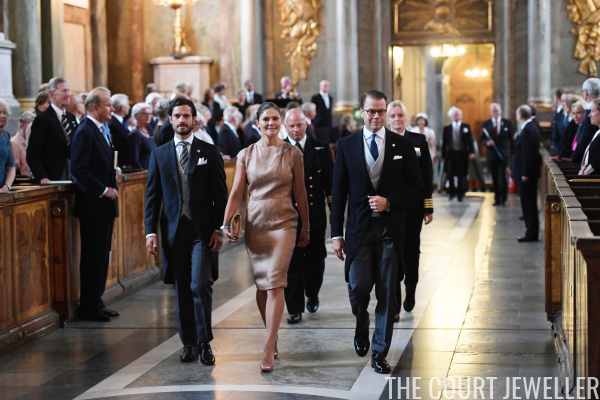 Gabriel's aunt, Princess Madeleine, wore simple jewelry with her floral dress. Madeleine recently announced that she's expecting her third child. 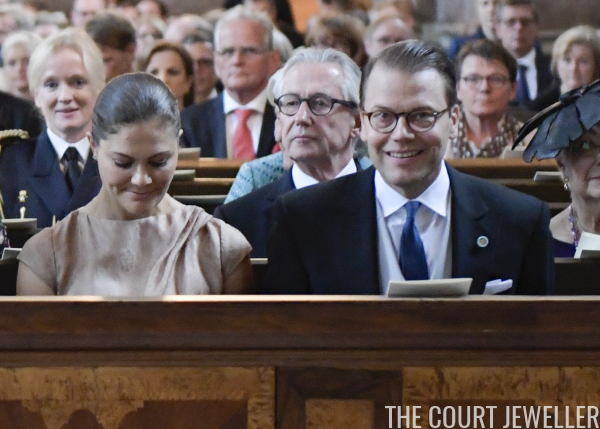 Behind Crown Princess Victoria and Prince Daniel, you can spot two more members of the family: Tord Magnuson and his wife, Princess Christina, who is the baby's great-aunt. The mother and the new baby don't traditionally attend the Te Deum service. Prince Gabriel relaxed at home with his mother, Princess Sofia, and his big brother, Prince Alexander. 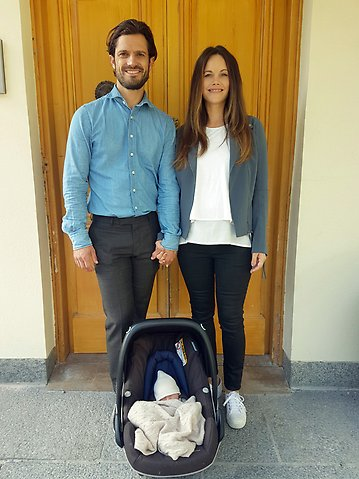 The royal court released the first photo of Gabriel with his parents (pictured above) last week as he left the hospital.